Warning: This is a super edition of the Warriors series by Erin Hunter. Spoilers of the series are included. In this super edition, Bramblestar’s Storm by Erin Hunter, the book follows Brambleclaw’s troubles after becoming Bramblestar, Thunderclan’s new leader after the last leader, Firestar’s, death. The latest battle against the Dark Forest, afterlife of evil cats, left all four clans, Riverclan, Thunderclan, Windclan and Shadowclan in ruins. Firestar is sent by Skyclan’s late leader in Starclan, afterlife of good cats, to deliver an omen even he doesn’t understand, “when water meets blood, blood will rise.” Many shocking events will occur, such as the Great Flood. When two of my friends suggested this series in fifth and sixth grade, I instantly shrugged them off because the characters were cats and had unusual names. But, soon after I started reading I was hooked. 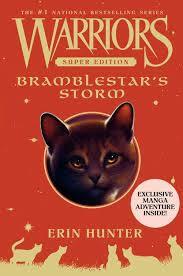 After almost a year I was down to the last super edition, Bramblestar’s Storm, which definitely lived up to my expectations. I can tell Bramblestar is becoming more of a leader and starts following his own mind instead of worrying about what Firestar would’ve done. Although Firestar is a very respectable model, being born a kittypet, house cat, and becoming a clan leader, Bramblestar needs to stop worrying about what Firestar would do. I love Erin Hunter’s writing because it’s always unpredictable, adventurous and she almost always remains in the characters’ perspective that I want to hear from. I recommend this book to anyone who likes adventure. Erin Hunter, made up of Victoria Holmes, Cherith Baldry, Kate Cary, Tui Sutherland, Gillian Philip and Inbali Iserles, have written another stupendous book with 473 pages in hardcover. Harper Collins Publishers made another great choice by publishing this book.